Meeker senior Kathryn Doll pulls in a rebound over Rangely’s Quincey Thacker in the first round of the district tournament. Meeker beat Rangely but lost to Paonia in the championship game. 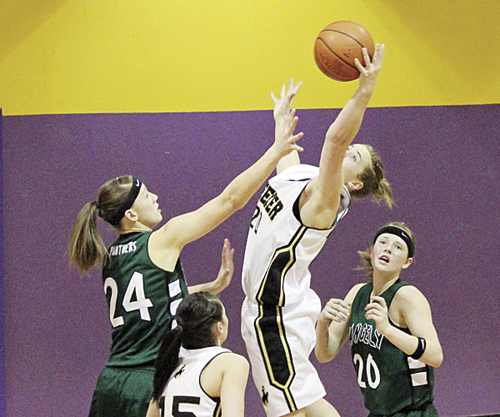 MEEKER I Meeker defeated the Rangely Panthers Friday, Jan. 23 to move into the championship game in the district tournament held in Kremmling. Saturday the Lady Cowboys lost to Paonia, ranked number one in the state for 2A girls’ basketball. Meeker’s second place finish sends the eighth-ranked lady Cowboys to Durango where they will compete against Del Norte Friday night at 7 p.m. The winner of this game will advance Saturday into the “Sweet 16” portion of the state playoffs against the victor of the Hoene and Ridgeway game. Saturday’s winner is then part of the “great 8” and will progress to play in the state tournament in Pueblo. The lady Cowboys started their weekend off with a bang. They outscored the Panthers 13-7 in the first quarter. The second quarter Meeker lost sight of the rim and was outscored by three Halftime closed with Meeker leading 23-20. In a third quarter rush the lady Cowboys quickly added nine points to the board while holding Rangley to only four. Late in the quarter, the Panthers rallied again to close the gap, but with Meeker still in the lead 35-30. To begin the fourth period the lady Cowboys seized an 11-point lead until a couple key turnovers changed the momentum and Rangely capitalized on the line to make it a four point game. With 35 seconds left in fourth quarter both teams were in double bonus and Rangely was forced to foul. Meeker hit their last four out of eight shots at the line to stay alive. 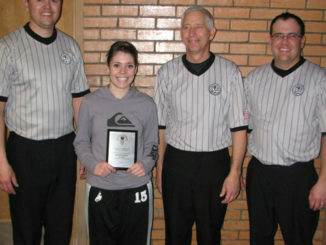 The majority of the lady Cowboys team contributed to this win as eight players scored. Junior Kaysyn Chintala led with eight, junior Katie Dinwiddie and sophomore Taylor Neilson both bucketed seven, senior Kathryn Doll and sophomore Aly Ridings cashed in six each, senior Aubrey Walsh and freshman Sydney Hughes each had five, and junior Kacey Collins drained four. Playing Paonia in the championship game, Meeker could not find the bucket for the first 2 minutes and Paonia led 11-0. Finally, Hughes opened up the game with two and the rest of the team followed suit as the first period ended 16-13, Paonia. Meeker came out firing, but Paonia could not miss leaving the lady Cowboys down by 14 (35-21) at the half way marker. The Eagles stretched out their lead in the third quarter 61-34. Finally in the fourth quarter Meeker picked up speed to outscore the Eagles 12-8, but the buzzer sounded and Meeker lost the battle 69-46. Paonia was shooting the lights out in this game as they shot the best percentage they have all season. As for the rest of the district tournament, Hayden defeated Rangely to win the consolation bracket. Paonia will play in Grand Junction, Hayden and Rangely will both travel to separate Denver locations to compete in their brackets of the regional tournament. The Meeker High School girls’ basketball team ended its season on a winning note with a 62-56 victory against Peyton in the consolation championship of the 2014 2A Colorado State Basketball Championships held in Pueblo.